New states launch on Square Payroll. 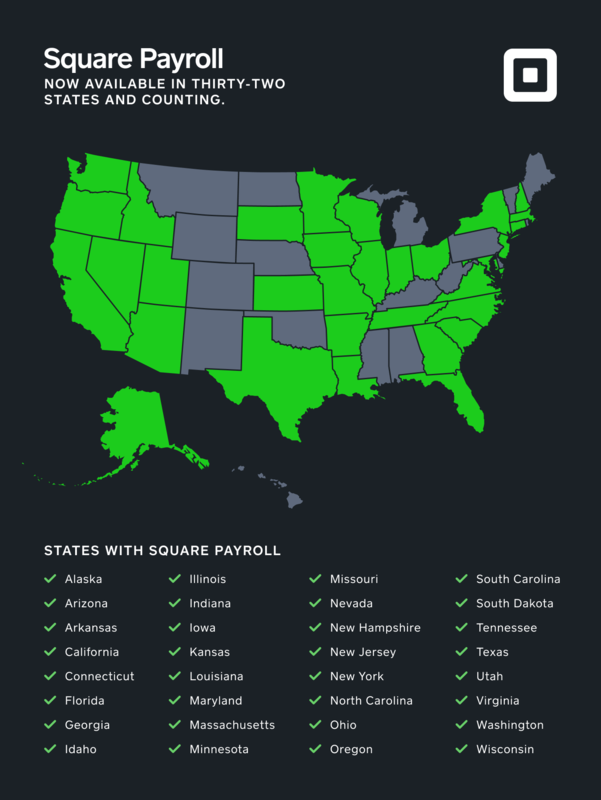 Square Payroll is now available in 32 states, including Iowa, Massachusetts, Ohio, and Oregon (that means around 82 percent of the U.S. employer market now has access to it). If you have hourly or salaried employees, check the map below to see where Square Payroll is available. If your state is highlighted, get started now. The new appointments point of sale. Square Appointments is now a full point of sale that combines online scheduling and payment processing in one app. The POS includes new features like managing and selling inventory and setting custom permissions for your staff, as well as running reports across staff and location. Sign up for Square Appointments to seamlessly run your business in one place. 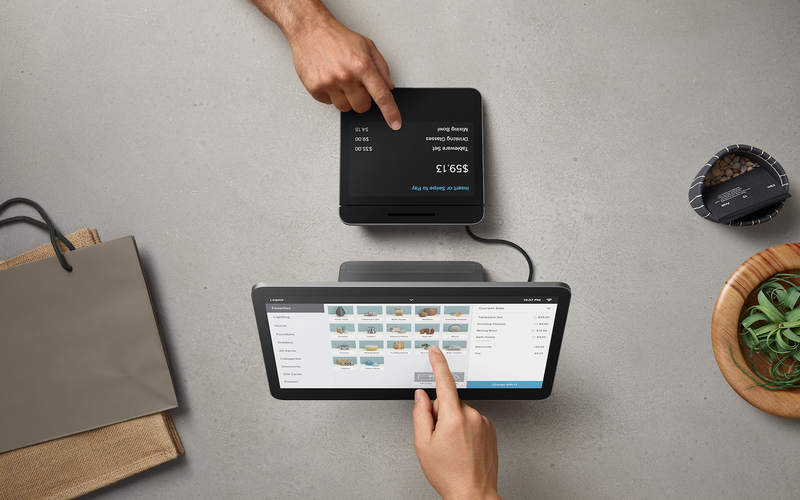 We recently introduced Square Register, our newest POS system that combines payments, software, and hardware — all by Square — no extra tablets or apps required. The included software gives you access to features you love from Square’s core Point of Sale app and integrates with Square’s suite of premium products. Square Register comes with a built-in customer display, which shows customers what they’re buying so you can sell accurately. Customers also pay on the display with a simple tap, dip, or swipe, and it’s our fastest EMV reader yet. 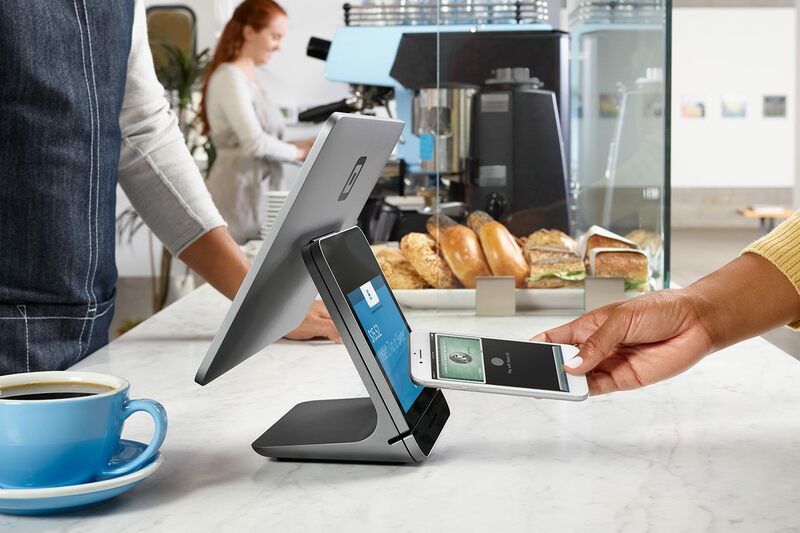 Take a look at the full list of Square Register’s features and watch the intro video. Hardware financing now available on Square.com. Looking to upgrade your Square hardware or add new accessories to your countertop? Orders on Square.com that are $49 and up may now be eligible for monthly payments; select at checkout. Easy application. Apply and instantly find out if your application is approved. We ask for just a few pieces of basic information. Checking eligibility won’t affect your credit score. Clear pricing. See up front exactly how much your business will pay. Depending on your order total, you can pay over 3, 6, 12, or 24 months. *A provider you trust. Enjoy the ease and security of an installments plan from Square, not a third-party provider. Offer promotions for eGift Cards. 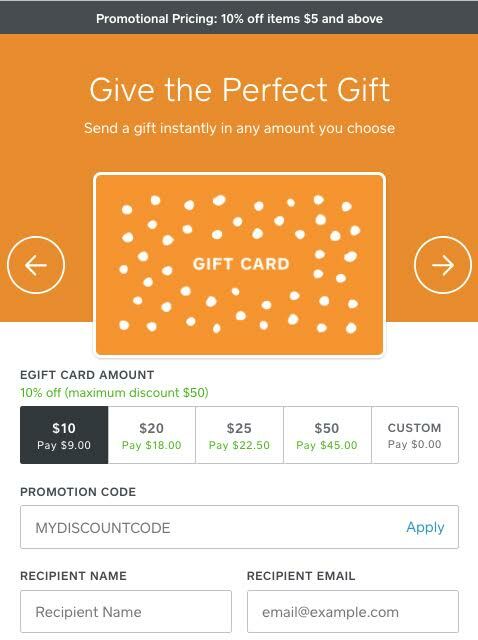 Just in time for the holidays, we’ve made it possible to offer promotions on eGift Cards. This new functionality in Dashboard allows you to offer discounts for everyone, or just for specific events. You can also promote these discounts to your customers via email on Square Marketing. Get started with eGift Card promotions. Manage rewards and unlink cards for loyalty in customer directory. We’ve improved the ability to manage customers’ Loyalty Rewards in Dashboard. Now you’re able to view and adjust a customer’s loyalty status and unlink cards associated with each customer. Learn moreon how to manage loyalty status. Access your Facebook photos from Square Marketing. Have a Facebook account? Now you can easily access your Facebook photos when creating Square email marketing campaigns. The new Square Marketing image gallery also saves recently used photos, saving you time when you want to build your next campaign. Try it now. Manage your inventory in Square Point of Sale. Now you can view and adjust inventory counts in the Square Point of Sale app using the item tab or item grid. All updates to inventory made in the app will be tracked and displayed in your Dashboard history. Learn how to check inventory in the Point of Sale app. We’re excited to share that platforms transacting with our eCommerce API or Square Checkout can get paid themselves on a per-transaction basis. Developers building solutions on these APIs now have a way to monetize their services by taking a portion of the transactions Square processes for the merchant. Learn more about some examples already in market and how to implement multi-party settlement. Square partners with GoDaddy to make online selling simple. Square has integrated with GoDaddy’s website-building platform, GoCentral. This integration provides product and service sellers with easy-to-use tools for building an online store and managing their online and offline payments. GoCentral websites can be built in under an hour and include digital marketing tools, and are mobile-optimized. Learn more about Square’s GoDaddy partnership.